This shows a field behind the main building with 6 sentry boxes. ON the right there are stores and quarters and a convent on the left. 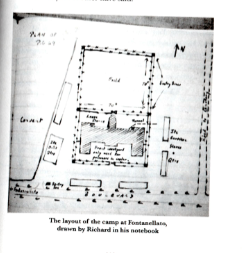 ​ This camp for 500 Allied officers and 100 other ranks was based at an Orphanage near Parma. On 9th September 1943, after the Italian armistice, 600 men marched out with the connivance of the Italian commandant and guards an hour before the Germans arrived .Unfortunately some got left behind .